You are here: Home / Search for "saint"
Springfield Armory has just released their new Saint AR-15 rifle with plenty of enhanced features. This is Springfield’s first move into the highly popular AR-15 market, and initial impressions of the Saint have been very positive. For the last month or so Springfield has been tempting the world with news of the Saint’s release, but initial press releases did not hint on whether the Saint would be a new pistol or rifle. The world now knows Springfield Armory has entered the AR-15 market. Though not necessarily a surprising move, considering the extreme popularity of the AR-15, Springfield is very late to the incredible expansion of the AR-15 brand. Previously Springfield Armory had made its name for popular handguns, and the revamping of the classic M1A rifle and Model 1911. Many, including myself, had surmised the Saint was going to be a whole new line of Springfield pistols, but the Saint AR-15 may still be competitive. With enhanced features and accessories the Springfield Armory Saint is not just another AR-15. This is just a small portion of the floor space SHOT Show takes up each year. The National Shooting Sports Foundation (NSSF) will host their annual Shooting, Hunting, and Outdoor Trade (SHOT) Show next week in Las Vegas, and we’ll be there to report on all the latest firearms, ammunition, optics, and gear. This post is our Pre-SHOT spotlight to include a preview of what’s coming and what we’re hoping to get more information about. This year the estimated number of vendors, media, and buyers is expected to above 70,000 making this year’s SHOT Show one of the largest in the entire history of the Show. 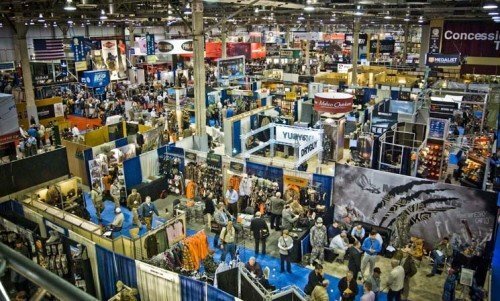 SHOT Show takes up the entire Sand’s Expo center for the week! I talk about body armor in episode #027 of the BlueSheepdog Podcast. I discuss the differences between exposed and concealed body armor for patrol officers, trauma plates and mandatory wear policies. In today’s BlueSheepdog Podcast, I talk about officer safety and your equipment. We’ve had too many police officers killed over the years, and deaths due to not using or caring for our equipment are needless deaths. I’m sick of police funerals. Regardless, here is the BlueSheepdog Podcast episode #007. This week’s podcast is something special with an interview of firearms instructor Rob Pincus. Rob took a lot of time out of his busy day to have a conversation about firearms training, how the body reacts under stress, the Combat Focus Shooting system, and if there is a place for the traditional range qualification in modern law enforcement. I think you will enjoy it.